Barog was partially cut off from the rest of the world with the state highway being closed to traffic since early morning today after a massive landslide triggered by a recent downpour. Landslides following heavy rain in the area threw drinking water supply schemes out of order on Tuesday night. The result: The residents went without water yesterday. A paradox seems to be prevailing among the Tibetan authorities and common Tibetans over the Beijing Olympics. While the Dalai Lama, spiritual leader of Tibetans, has congratulated Chinese people for organising the Olympics, the common Tibetans under the aegis of their NGOs organised a march against the event. The Paonta and Puruwala units of the Regional Tibetan Youth Congress (RTYC) held a protest against the holding of Olympics in China and the continuing occupation of Tibet by that country, at Paonta today. 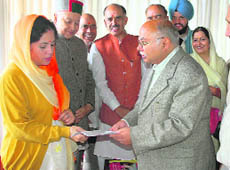 Chief Minister Prem Kumar Dhumal is learnt to have given a green signal to hand over the vigilance inquiry into the allotment of over 273 technical SCVT institutes by the previous Congress government from 2005 to 2007 without allegedly adhering to the norms prescribed by the Central Council for Technical Education (CCTE). The government has decided to implement the Rs 297-crore Swarghat-Bilaspur tunnel project in public-private partnership (PPP) using the viability gap-funding facility. The project is said to be the only economically viable venture out of the eight proposed road tunnels. Activists of the BJP, the Vishwa Hindu Parishad (VHP) and the Bajrang Dal today staged a demonstration outside the residence of MP, Pratibha Singh, opposing cancellation of the land given on lease to the Amaranth Shrine Board. Members of the Vishwa Hindu Parishad (VHP) today took out a rally here in support of agitators of Jammu in connection with the Amarnath land row. They also held a demonstration outside the residence of former Pradesh Congress Committee chief and sitting Rajya Sabha member Viplove Thakur at Birta village on the outskirts of the town. The H.P. State Council of Agriculture, Horticulture and Forestry Education and Research, has decided to enhance student intake in its undergraduate, postgraduate and Ph.D programme at Palampur Agriculture University from the existing 131 to 215. Minister for public health and irrigation, Ravinder Ravi, has ordered an inquiry into single-tender works, allotted to the department in period ranging from 2006-2008. The Shimla district Congress committee has condemned the indifferent attitude of the government towards the woes of apple growers who were facing difficulties due to shortage of packaging material and bad conditions of road. The hill state experienced widespread rain over the past 24 hours as monsoon continued to remain vigorously active in the region. As per reports received here, Preeta Singh (62), a resident of Khera village under Paonta subdivision, was washed away this evening in the Bata river. Residents of Ansoli village panchayat are up in arms against the village pradhan demanding action against him for his alleged anti-people policies, misuse of official position and the alleged corrupt practices. The landslide occurred around 5.30 am. While three houses atop the hill got extensively damaged, two others developed cracks that rendered these unfit for habitation. Tourist resort Barog Heights had a narrow escape even as no loss of life was reported. Panic gripped the area as this was the first landslide of this magnitude. The large-scale mining in the area along the hill could be the cause behind the landslide, said Rakesh Verma, a local resident. A non-functional stone crusher was also buried under the debris. The police got vacated two houses in the morning. One of these belonged to additional director-general of the All-India Radio Deepak Sandhu. At the time of the mishap, her mother Satwant Kaur and her aunt Jyoti Kalia were at home. The house of 93-year-old Maj-Gen G.S. Brar (retd) was also got vacated. He and his 83-year-old wife were shifted to the Kumarhatti forest guesthouse. The administration deployed a team of IPH workers, firemen and policemen to empty a 70,000-litre underground water tank located in the verandah of Satwant Kaur’s house. This could have posed a serious threat to the remaining two houses that had already developed cracks, naib tehsildar Narayan Chauhan said. Scores of huge pine and eucalyptus trees were uprooted in the landslide. Tonnes of debris and big boulders that had come down on the highway damaged the parapet of the road. Boulders continued to roll down the hill intermittently, sending PWD workers and passers-by into a tizzy. Traffic was diverted through the Barog bypass. Though officials assumed that the mining activity that had been going on in the area for quite some time could have triggered the landslide, mining officer B.D. Sharma maintained the area was leased out only from 1987 to 1993. He, however, admitted that some intermittent mining activity continued even after that. However, after the visit of a high court committee in September, 2003, no such activity was underway in the area, he claimed. 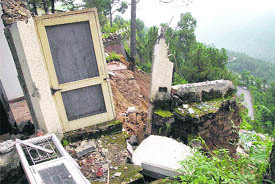 Interestingly, the three houses that were damaged in the landslide were in the process of being resumed by the government under Section 118 of the HP Land Reforms and Tenancy Act as the outsiders had not obtained permission for buying these properties, ADM Rakhil Kahlon said. S.P.S. Verma, Solan SP, said the PWD had been directed to break the big boulders falling on the road to avoid any untoward incident. The highway will remain closed for traffic for at least two more days. Boulders that rolled down the hills damaged pipes of two water supply schemes on the outskirts of the town. 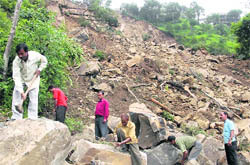 Initially, landslides hit the supply line of the old Harnora Ghat scheme on Monday. It could not be set right till today. Now, recurring landslides have buried about 800-foot-long supply line of the new Chakki-Nurpur scheme at Sanera. The place is just above Jabbar Khud. The supply to the town has been disrupted. According to the information, over 7,000 consumers have been affected due to the damaging of water pipes. Employees of the Irrigation and Public Health (IPH) Department have been trying to repair the pipes since morning under the supervision of departmental executive engineer Sunil Dutt Chowdhary. According to Chowdhary, workers are facing tough time as they have to work on a steep gradient just above the flooded Jabber Khud by tying ropes around their waist. The restoration of water supply was likely to take another two to three days, he added. It is for the first time that both water supply schemes have been hit at the same time. Meanwhile, municipal council president R.K. Mahajan has urged the IPH Department to supply water to the consumers through tankers till the repair work was over and the supply restored. Dalai Lama in a short message on his official website of Tibetan government-in-exile has stated ‘I would like to offer my greetings to the People's Republic of China, organisers and athletes participating in the forthcoming Olympic Games in Beijing. Right from the time of China's application to hold the Olympic Games, I have supported China's right to host the games. This is a moment of great pride to the 1.3 billion Chinese people. These games should contribute to promoting the Olympic spirit of friendship, openness and peace. Despite the said message of the Dalai Lama hundreds Tibetans today organised a protest march from Macloedganj to Dharamsala court complex carrying banners and raising slogans against the Chinese Government. The protesters alleged that the Chinese authorities have launched a crack down against the Tibetans in Tibet. They demanded from the international community to exert pressure on the Chinese authorities to end alleged atrocities against Tibetans and initiate dialogue with the emissaries of the Dalai Lama. The Tibetan youth congress that launched march back to Tibet in March has also planned series of protest during the Olympics to attract the world attention to their problem, the sources here told. Around 150 protesters, including a large number of women, marched through Badripur, Shamsher Pur and the main market of the town. They were carrying banners and raising slogans against China. The protest ended near the SDM’s office. President of the Puruwala RTYC Pema Dolma, president of the Paonta RTYC Sherab Gyatso and some other Tibetan leaders addressed the protesters on the occasion. Sources said the CM had marked the inquiry to the State Anti-Corruption and Vigilance Bureau. The Department of Technical Education has recently started issuing show-cause notices to over 115 technical education institutes in the state, asking these why action should not be taken against them for failing to provide proper staff and infrastructure to students. Sources said 112 vocational institutes were allotted in 2005-06 while 161 institutes were allotted in 2006-2007 throwing CCVT norms to the winds. “The axe may fall on the technical education directors who served during that period,” they said. Official, however, maintained that the institutes that had proper staff and observed other norms prescribed by the CCVT would not be touched. As per the feasibility report prepared by the Road and Infrastructure Development Corporation, the volume of vehicular traffic on the national highway was over 20,000 PCUs (passenger car units) that made the project feasible under the viability gap-funding scheme. The Centre will have to provide viability gap funding to the extent of 20 per cent. This will be matched by the state government. As such, they will have to shell out Rs 60 crore each for the execution of the project. The corporation has assigned the task of preparing a project document for constructing the tunnel in the PPP mode to a private consultant. The proposed tunnel will be only 1,750-m-long, but have 19 km of approaches on both sides that will help reduce the distance by over 20 km. 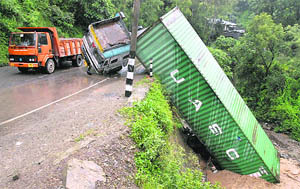 It will help avoid the steep climb to Swarghat hilltop, saving vehicles from wear and tear besides curtailing the travel time between Chandigarh and Bilaspur by about an hour. The 19-km stretch of the approach roads will also involve construction of two bridges on the backwaters of the Gobindsagar reservoir. The new highway will take off from Kainchi Mor and join the existing road near Mehla. The seven other proposed tunnel projects are not economically viable, but necessary to ease traffic congestion and improve connectivity. These include two tunnels in Shimla to ease congestion on the Circular Road. While the 860-m tunnel connecting the HIMFED petrol pump to the IGMC will cost Rs 73.71 crore, the 1,140-m Lift to HIMFED petrol pump project will cost Rs 100.62 crore. The 270-m tunnel on the Ranital-Kangra road is estimated to cost Rs 35.57 crore, the 2-km Bagana-Dhaneta tunnel will cost Rs 200 crore, the 4-km Karsehar to Telang tunnel Rs 400 crore, the 2.84-km Khara-Patthar tunnel Rs 246.56 crore, while the 4-km Holi to Uttrala project will cost Rs 500 crore. The activists protested the policy of the UPA regime of minority appeasement. They later handed a memorandum to the MP and demanded that she should convey to the UPA regime that the decision had hurt the sentiments of crores of Hindus in the country. They said in case the government did not return the land to the Shrine Board, they would further intensify their agitation. Shimla BJP chief Ganesh Dutt said the religious sentiments of Hindus all over the country had been hurt by the decision of the Jammu and Kashmir Government to withdraw the lease of 100 acres given to the Amarnath Shrine Board. “The UPA regime has always perused the policy of appeasement of the minorities which will be opposed by the BJP, the VHP and other such Hindu organisations,” he said. The protesters led by Swami Krishen Giri raised slogans against the UPA government and demanded sacking of Jammu and Kashmir Governor N.N. Vohra. According to family sources, Thakur was on a tour to Kinnaur when the VHP workers held demonstration outside her house. The protesters held a dharna on National Highway No. 88 and blocked the highway. Vehicles were stranded on both sides of the road which included official and pilgrim vehicles but no police personnel was seen anywhere to regulate the traffic and to maintain law and order. VHP leader Ravi Shanker addressed the gathering and demanded revocation of the cancellation orders of the J&K Government and the land in controversy be handed over to the Amarnath Shrine Board. He announced that on August 13, a two-hour ‘chakka jam’ would be held in Matour on the Pathankot-Mandi national highway. The decision has been taken to enhance the intake of students in the vocational courses in various educational institutions. An official spokesperson said here today that this would lead to 68 per cent increase in the number of seats at the university. The number of seats in the undergraduate courses would be increased from 59 to 100, in the College of Agriculture from 14 to 30, in the College of Animal Husbandry and Veterinary from five to 15, in the College of Basic Sciences from 30 to 40 and in the College of Home Science from 10 to 15. He said the increase in the postgraduate courses would be from 55 to 85. Besides this 40 per cent increase in seats would be done in the Ph.D programme as the number of seats will go up from 17 to 30. The spokesperson said the council had also approved the proposal for institution of the M.Sc programme in Environmental Science and creation of the department with the intake capacity of 10 students. The minister said the Congress government allotted development works to their favourities on the single tenders in the Bamsan-Lagwalti drinking water scheme. By issuing the works against the single tenders, quality of work has been compromised. Besides the scheme, many other works were allotted against the single tenders during the regime of the previous government that led to loss of public money and the poor quality of work. He also criticised Congress MP from Kangra constituency Chander Kumar for politicising issue of the central university. The Congress MP had alleged that the BJP was shifting the central university from Dharamsala to Dehra. He, however, alleged that Chander Kumar had shown bias towards his native place. In the last five years, Chander Kumar has allotted Rs 6 crore out of Rs 9 crore he received as the MP for the development of Guler constituency. Rest of the district has received a grant of Rs 3 crore only. President of the committee Vidyasagar said that the growers were being supplied poor quality apple cartons at exorbitant cost. The prices of cartons were Rs 20 to Rs 22 higher compared to last year. Not only that the prices of fungicides, insecticides and other inputs had also gone up considerably. A stock of only 20,000 cartons was available in the HPMC outlets at Rohru, Kotkhai and Jubbal whereas the demands of the growers ran into lakh. Heavy rain triggered off numerous landslides affecting vehicular on the link roads in the interior areas. In many places trees were disrupting power supply and telecom services. In Barog a huge landslide blocked the national highway but traffic continued to ply through bypass. Una recorded the highest precipitation 54.2 mm, followed by Naina Devi 40 mm ,Kaho 32.2 mm, Shimla 31.7 mm, Berthin 27.6 mm and Sundernagar 10.6 mm. The city and the surrounding areas had intermittent showers throughout the day. The hills remained engulfed in thick fog which reduced visibility to a few feet. Poor visibility affected the pace of traffic in certain areas. The Met office has predicted more rain over the next 24 hours. As per the police sources, flow of the river washed him away while he was trying to cross to the other side of the river. Immediately a hunt was launched by the local residents and the Paonta police to locate him and finally his body was recovered from the bank of the river. The police has sent the body for a post-mortem. In a letter to director of the Rural Development and Panchayti Raj Department Shrikant Baldi, 273 residents of Ansoli village have said the village was faced with the low-voltage problem and they had approached the HPSEB authorities. The panchayat passed two resolutions on June 25 and July 31 demanding immediate measure to set the problem right, but village pradhan gave a letter to the authorities that there was no such problem in the village, they said.